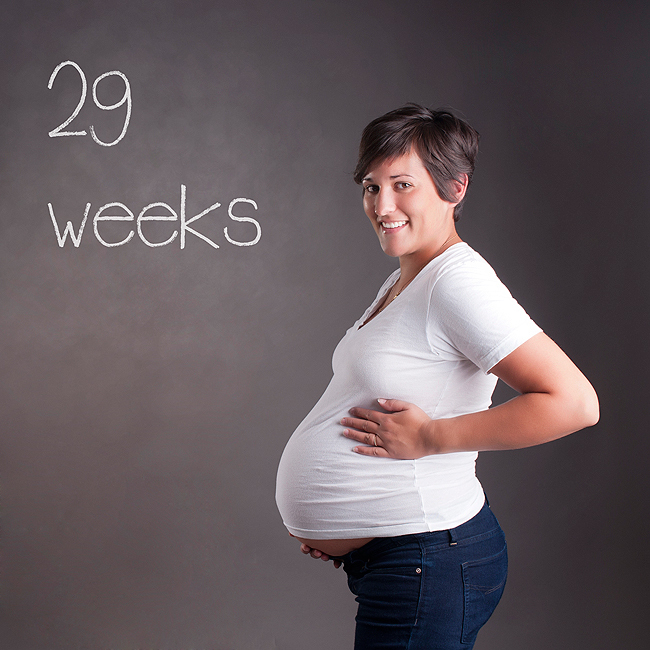 Once we entered our last trimester, everything I read said that I would suddenly be more tired, achy, and slower. Everything I have read has been right. I can tell that you are working very hard in my belly to get ready for the world and it takes a lot of energy for all of that to happen. Naps are once again part of my schedule like they were over the summer. Even with naps, I am still able to go to bed early and I savor every minute of sleep I get. I had my first really vivid dream about you. It was about the day that you were born. Your delivery was very easy and after we met you, your papa and I went out. While we were out, we both said, "Wait - what are we doing? We have a new baby! Let's go home." When we got back home your Cookie was taking care of you. We asked where you were and when she told us you were sleeping in bed, we found you all the way under the covers at the foot of the bed where Lucy likes to sleep. And in my dream you were... a baby boy! The most I can take away from the dream is that there will definitely be some changes that need to happen in our family bed. We'll make it work! Lucy knows how to make herself comfortable anywhere, especially the couch. On Friday while I ate lunch, I felt you moving around. I put my hand on your sweet spot and clear as day I felt your little foot. As soon as I recognized it you pulled back in but it was so incredible to be able to distinguish your little parts. You have been moving so much these past few days. Our secretary at work, Sylvia, has been dying to feel you since the first day of school. She puts her hands on my belly everyday and says, "Kick mommy!" As I heated up my lunch today in the lounge I sat down beside her. You started stirring so I grabbed her hand, put it on my belly, and told her to be patient. Within seconds you kicked her good. Her eyes welled up and she got the biggest, silliest grin on her face. You have the most amazing power to make people happy. Thank you for making long, tiresome days totally worth it. Looking at this week's picture I can see why I constantly feel like the bottom of my belly is hanging out of my shirt. Yowza! Hi! Tip on dogs and babies - a duo made for each other by the way - bring a baby blanket home from the hospital for Lucy to smell before you bring the baby home. Put it on your bed, move it to the sofa, etc. This gives Lucy a chance to not be threatened by that newbie baby smell in HER house. "Intruder Alert!" Or "Why did you get a puppy? Geesh!" Lots of good books out there on babies and dogs and their so important intro. Enjoying your blog!